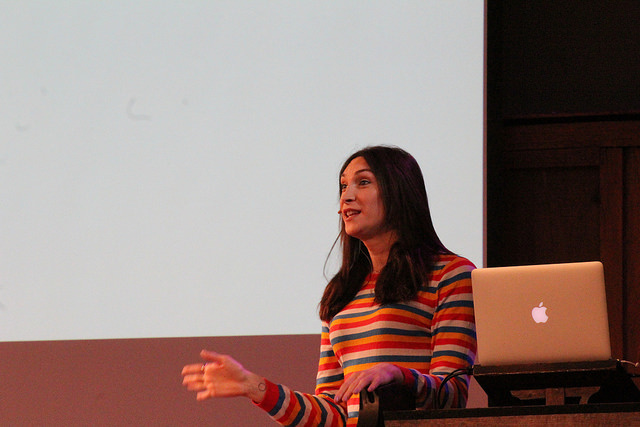 This talk may not be fully on brief… it’s about the side hustle of being a story teller. She is a storyteller first, and everything else second. but there is always the side hustle. She got into writing a weird way; she was a primary school teacher in Brighton.. she was borrowing the books from her kids. There was a book with an apple on the front that a lot of girls were reading – it was Twilight, started borrowing more, it was felt to be a golden age – eg hunger games etc… started realising these books had everything. She had been a big fan of high school movie and these books were the equivalent. It then stopped being fun..it was the job. Her second book was not easy, the sequel to Hollow Pike. Then the 1st book was not selling well, so asked to bench the sequel (after 1 week of sales)…it felt like she had failed, she could not talk to people. Her advance did not go as far as she thought it would do. The agent got some, it came in chunks, the taxman got it, She had quit her job, moved to London and her money was dwindling really quick. So what could she do? Go back to teaching..so everyone would see she had failed. She decided now she needed a side hustle. so that was the Carrie Bradshaw model..a freelance journalist. She had just read Caitlin Moran and recognised that non-fiction could have a character. The publisher agreed..she would also interview lots of people of different types. Through this process, she recognised that she herself was trans. The book has just been published in its 22nd language. Has lots of good feedback about it. The reason she is still here, writing full time and speaking, the side hustle of writing non fcition has become more lucrative. Storytelling and novel writing is now a lovely hobby again. fiction writing brings her the greatest satisfaction. The pressure has been removed and she does not have to churn out fiction, so not reliant on the advance checks. She has time to breath. Thinks her next novel is one of her best works.. it was fun to write, wrote last summer over 3 months, character just came to her. She was supposed to be writing The Gender Games…but the story was demanding to be told. The reviews have started to come in and they have been glowing, she thinks the readers can tell how much she enjoyed writing it. And the reason she can do that is the hustle of non-fiction…she’s just had her first commission from Cosmo.. now shes back to where she was in 2010…really enjoying the storytelling. Maybe the take home message is get good at something and then get good at something else. This entry was posted in books, conference by Rachel. Bookmark the permalink.